For those of you who know me, you might think it is a bit out of character for me to be planning to run the Napa Valley Silverado 10-K Marathon on April 17. If you told me a few months ago I would be running a 10-K marathon, I would have not believed it either. But I decided to do it for a very good reason: to demonstrate my commitment for a great project, Fandango Pandanggo, a music, dance and multimedia performance that highlights and honors the musical connections between the Philippines, Mexico, Cuba, and Spain. What is Fandango-Pandanggo about? And why am I asking for some of your hard-earned money? In abstract terms, Fandango-Pandanggo pays homage to the intertwined cultural roots that connect four continents (Asia, America, Europe and Africa). F-P encourages the exploration of our past and the acknowledgment of everyone’s contributions to the music world of today. I began playing music with Florante Aguilar six years ago when he hired me for one of his productions. Florante is a guitarist with a solid classical training and a technique that is precise, sensitive and consistent. He is also a composer with a contemporary open mind and profound love and dedication to for the traditional music of his country. Our shared interest to creating new contemporary music that remains in contact to our cultural roots has kept us collaborating since that time. As I became familiar with his music and the music of the Philippines my interest to learn more grew. I was astonished to realize that the music I associated with my childhood and my home town, like the jota and fandango, was also the music Florante associated with his childhood in Philippines. When I was ten I was playing laud in a rondalla ensemble. At that age, Florante was playing octavina, also in a rondalla ensemble. Octavina is a string instrument similar to the Spanish laud. The octavina is not the laud and the jota I know is not the same as the jota Florante plays, but the link is clear. As I became more acquainted with Filipinos and Filipino culture (food, celebrations, humor, etc. ), I felt a familiarity that further stimulated my curiosity. Since I have dedicated my professional life to playing, studying and teaching Latin music, learning Filipino music felt very much as a continuation of that work. Of course, Filipino music is a world unto itself with many sub-worlds. Certain genres have clear connections with Latin music, others don’t. Florante introduced me to harana, kind of a cousin of the habanera; to the pandanggo, with ties to the old fandango; to the wide range of Filipino jotas, to the rondalla music, etc. I also learn about the wide range of music of the many ethnic cultures that inhabit the archipelago. Two years ago Florante and I received a grant from Friends of Chamber Music to do research on the topic of Latin-Filipino musical connections and to compose new music informed by our reflections. This was the seed that will germinate on May 21, 2016, with the performance of Fandango-Pandanggo at the Cowell Theater in San Francisco. Ticket sales will not be enough to cover all production costs because Fandango-Pandanggo is not just another performance. It is the result of two years of work, research and planning. The program is an original; it debuts new arrangements of traditional music and new compositions, dance choreographies and film. It involves 16 unique artists of the highest caliber. I am writing to ask you to sponsor my 10-K run, with all the proceeds directly benefiting Fandango-Pandango. Your donation can be as low as $0.10 per kilometer ($1) or as great as $100 per kilometer. Any amount will be greatly appreciated. All sponsorship/donations will receive a tax-deductible donation letter directly from KulArts, all donors/sponsors will be listed on the KulArts, Potaje and Fandangueros websides. 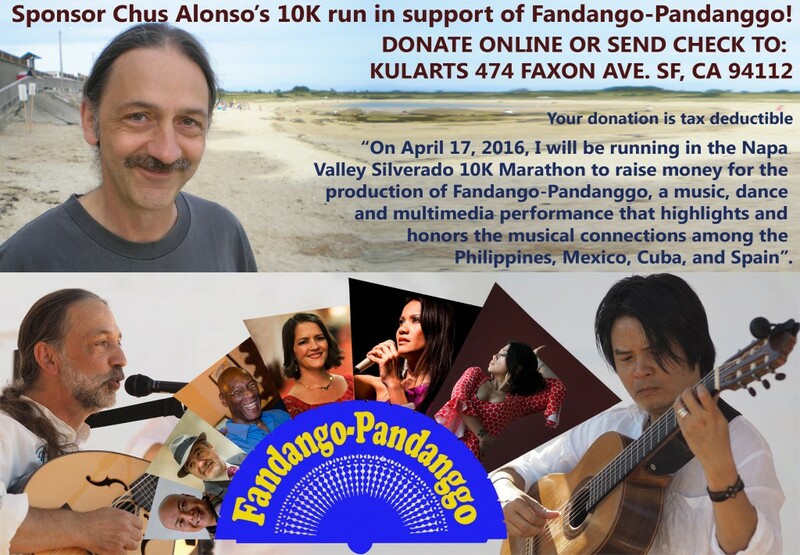 My colleague, Florante Aguilar, is also running for Fandango-Pandanggo. We have the goal of raising $5,000 ($2,500 each) by April 17. Please help me reach my final goal of $2,500 by April 17—every dollar per kilometer helps!. You can send your donation/sponsorship directly to KulArts’ Paypal account HERE or via check to Kularts 474 Faxon Ave SF, CA 94112. Please be sure to include, in the memo/message section the word FANDANGO. Last but not least, I want to thank KulArts for their support of this project. KulArts is an organization that has served the South of Market Area, San Francisco/Bay Area, California and the larger Filipino diaspora for the past three decades. Check out the impressive list of musicians, dancers and multimedia artists. All sponsorship/donations will receive a tax-deductible donation letter directly from KulArts, all donors/sponsors will be listed on the KulArts website.